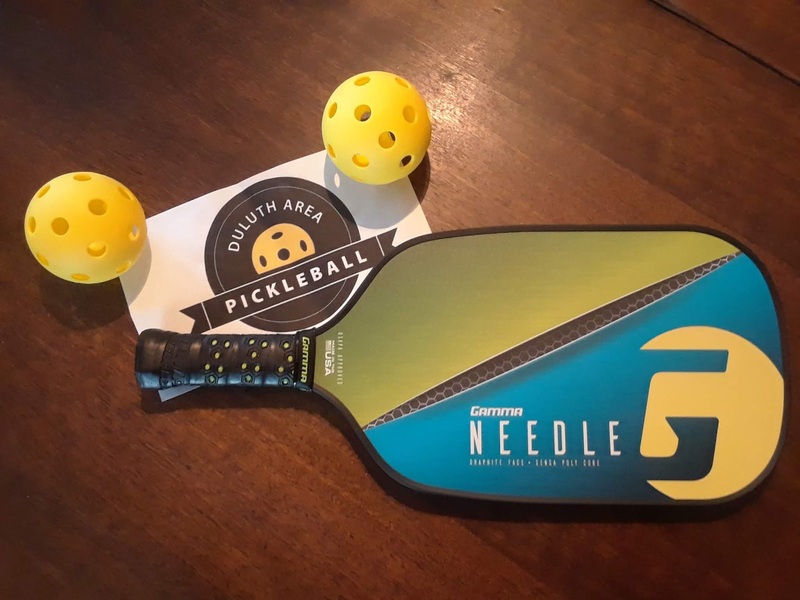 During out club's open play, several of our players got the chance to use the Gamma Needle Graphite Paddle to get familiar with the paddle. We wanted feedback on the weight of the paddle, the feel of the grip and how the paddle handles when hitting the ball. One player said that he like the feel of the "tacky" grip which prevented the paddle from spinning in his hand. He felt the Gamma grip was comfortable, even though it is shorter with smaller diameter than his current paddle. This player especially like the longer length and was positive that he was able to reach more shots with that extra length. The textured surface also helped him in adding spin to his shots. Another player said he like the Gamma paddle overall. What he particularly liked was the relatively light weight and the "grippy" handle. He felt the paddle gave good touch and better control with his overhead smashes. The Gamma paddle's surface is about 3/4" longer than his current paddle which gave him a good reach, and he had more contact with balls when reaching compared to his own paddle. A third player mentioned that what she liked most about the paddle was the extra length. She felt the longer paddle gave her more confidence when reaching for shots that she may not have been able to hit with her own paddle. Another player's thoughts were that she really liked how lightweight the paddle felt, yet it had the power needed. She was skeptical of the elongated paddle but the extra reach far outweighed the narrower face, as it helped get shots that she could not have gotten with own paddle. She like the feel of the grip and size was perfect. The paddle's surface gripped the ball so she could control her delivery angles. Other comments included "awesome grip", "great for dinking" and "good sound". All players who tried out this Gamma paddle had positive feedback and mentioned that they would definitely consider buying this paddle in the future.